It's just over four weeks now before we start rehearsals in Armidale! Time has flown over the last few months, but we have been busy. After our last trip to Armidale, Jo then locked himself in a room for pretty much the whole of May, writing the first draft of the play, which has the working title of In Between Wonderful. As first drafts often are, it was epic! More than 40 characters populating over 100 pages. He and I then spent a couple of weeks shaping and shaving, to get to a draft that we could then bring in to our development workshop. We then spent a crazy but wonderful two weeks in the loft at STC with actors Danielle Cormack, Eamon Farren, Al Flower and Amber McMahon, stage manager Beck Palmer, and resident designer and all round genius, Renee Mulder. Working on the development of a new piece of writing is a really different skill to rehearsing a show for production, and we were really lucky that all our collaborators all know how to put their development hats on, and get stuck in. The play was read, pulled apart, put back together, thrown out with the bath water, resuscitated, reformed, renewed and reinvigorated over an intense period of time, mainly in the first week. Jo, who had really spent the previous month in solitary confinement, reading the play aloud to himself, suddenly found the play populated by voices and bodies, and fifty opinions being hurled at him from all angles, which is a dizzying experience to say the least. But trouper that he is, he uncrossed his eyes, took all the notes, and managed to redraft the play six more times over the course of the workshop. Characters were cut, new characters appeared, imaginary underworlds were mapped, and a talking kangaroo turned into a talking goat. At the same time, Renee and I were working furiously to work out how to bring Jo's invented world to life on stage. As scenes were written and rewritten, so were design sketches and ideas. We have 14 different settings and 24 characters to realise. The brief - be simple, imaginative, and use what we already have as much as possible. Renee and I have a shared love of anything old and theatrical, and since the action of the play now takes place in the lead up to the Armidale show, a carnivalesque quality runs through the design. The Hoskins Centre, where we're staging the show, has an amazing revolve on stage, so we're also going to use that heavily! We'll also use our actors to create staging as much as we can, so the design will be about signposting the act of communal imagination more than anything. At the end of our two weeks of laboratory, we had some special guests come down to Sydney from Armidale - four of the students we had worked with in the Easter holidays, and their teachers. 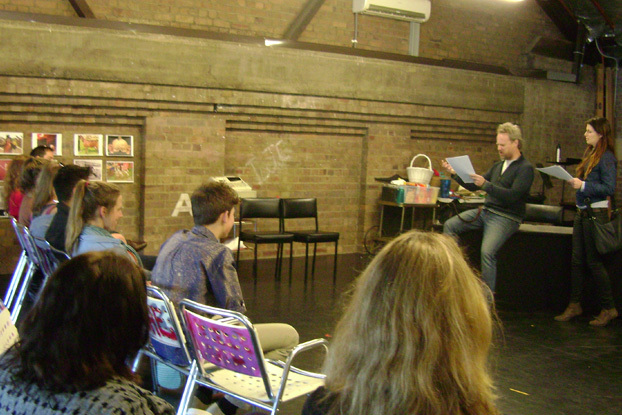 We did a reading of the final workshop draft of the play, and they were fantastic in their detailed feedback, particularly around the specificity of Armidilian quotidiana, and school life.